The starting On Your Feet carries the signature of Rahn (sax) and Vaughn (bass) both impressing on their respective instrument. A certain proximity to Wayman Tisdale's style is unmistakable. In the vein of Wayman Julian takes the lead on J's Jammin and treats the bass like a guitar. Ju Ju's Groove features as additional musician keyboardist Nicholas Cole joining Julian's affinity for heavy funk. With The Thought Of You Vaughn breezes romance into the bass. His reflective performance is well supported by Nathan Harasim with sparkling tones on piano. With great excitement he knows to impress his audience on Breakthrough. Singer Tobbi White-Darks is his vocal standard bearer. Vaughn worked with soul mate Anthony Saunders on the R&B song I'll Do It. Bass player himself Saunders takes over the vocal and other instrumental parts. Be My Girl is the second R&B flavored song featuring Saunders as excellent vocalist. The Whispers have inspired with the chart-topping Rock Steady many artists such as Kylie Minogue or Paul Jackson Jr. Assisted by producer and sax player Nicholas Cole Vaughn creates a vibrating rendition. No Matter is a good example of Vaughn's main concept of song structure. With a great affinity for the R&B realm he takes the lead on bass like a singer. The songs are overall harmonious and the bass executes the melody in extensio. The pounding beat is also a popular element in the smooth jazz. As shown up on Right On Time Vaughn cannot resist to use it. Is there anything thoughtfulness on the album? Always Be Together seems to be moving in this direction. 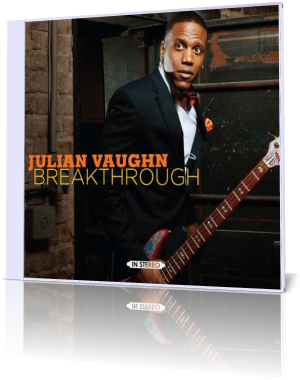 Julian Vaughn snatches with his album Breakthrough for popularity following Tisdale's huge footsteps. His infectious mostly self-written songs certainly have what it takes to achieve this goal.